A desperate Kremlin takes advantage of a military crisis in Asia to simultaneously strike into Western Europe and invade east Africa in a bid to seize a Rare Earth mineral mine that will give Russia unprecedented control over the world’s hi-tech sector, for generations to come. Pitted against the Russians are a Marine lieutenant colonel pulled out of the Pentagon and thrown into the fray in Africa, a French Special Forces captain and his intelligence operative father, a young Polish female partisan fighter, an A-10 Warthog pilot, and the lieutenant colonel of an American tank regiment who, along with a German panzer battalion major, fight from behind enemy lines in Germany through Poland all the way to the gates of Russia. From a daring MiG attack on American satellites, through snow-capped peaks and air battles in all theaters, undersea warfare in the Arabian sea, and small unit fighting down to the hand-to-hand level in the jungle, Russia’s forces battle to either take the mines or detonate a nuclear device to prevent the West from ever getting their hands on the precious and scarce rare earth metals in - RED METAL! Q: How did Greaney and Rawlings meet? A: Lieutenant Colonel Hunter Ripley Rawlings (Rip) and Mark Greaney met while Mark was researching Command Authority, his third collaboration with Tom Clancy. Rip was working at the Pentagon as a strategic planner and one of the Pacific war plans officers at the time. A 22-year Marine Corps infantry and reconnaissance officer, Rip had begun writing fiction himself and asked Mark for advice on the craft and the business. Rip offered Mark a tour of the Pentagon and over time they developed a friendship due to their many similarities; a shared love of writing, reading, and history, of SCUBA diving, training with firearms, and even rock drumming. Over the next few years, Mark and Rip met often, usually at microbreweries, both in the D.C. area and in Southern California. Q: Where did the plot idea come from? A: Over email, the two began discussing an idea Rip had for a book about a war between NATO and Russia. Rip was now an infantry battalion commander of the Marine Corps’ Darkhorse battalion, the 3d Battalion, 5th Marines. Stationed in Camp Pendleton, north of San Diego, the two met there and again at the battalion’s Marine Corps Birthday Ball in Las Vegas. In a hotel room in Vegas, Rip laid out maps and charts and a rough outline and the two hashed out ideas together for hours over coffee. Soon Mark asked Rip if he’d be interested in a collaboration, and this became Red Metal. They travelled to France, Poland, and Germany for research, as well as Nellis Air Force Base in Nevada, and wrote the book over the next two years. Q: Is the tech in Red Metal real? Follow-up: is the techs employment on the battlefield descried in Red Metal realistic? A: Absolutely. Scary, isn't it. Yes, the tech is current generation weapons and technology. 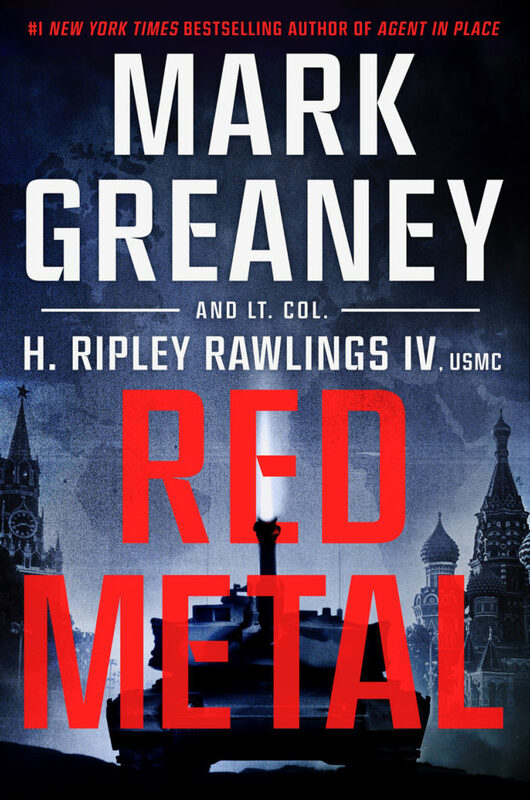 Obviously the intrigue and suspense of Red Metal is really made more engaging by the plausible figures, the Russian Generals and American and coalition counterparts. Q: What are REMs, what are they used for? A: Rare Earth Metals (REMs) are organic solids that are mined from the surface and sub-surface. They have properties of metals that are highly sought after as they can be optimized to suit specific electrical and miniaturized mechanical specifications. Their use are for high end computers, specialized lasers and weapons like guidance systems and direction finding equipment. The fight for Rare Earth Metals (REMs) is ongoing and global. China has a dominance on the market, seconded closely by the USA, this means Russia is quite literally buying its future from her foes. Currently, this paints an angering proposition and an annoying and frustrating future for Russia in the tech sector.